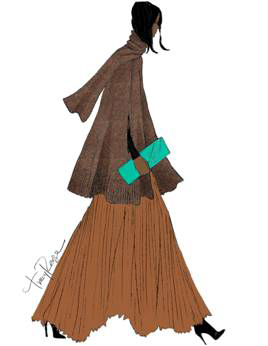 All Posts Tagged With: "Tracy Reese"
For fall 2012, Tracy Reese offers an optimistic color palette of vibrant tomato, juniper green and lemon enlivening neutral browns, grays and black. For spring 2012, designer Tracy Reese is inspired by a land of pure delight. Softly voluminous styles pair with lean, refined silhouettes, evolving proportions with a focus on modern fluidity. “A feminine yet relaxed mood is achieved through the juxtaposition of romance and sport, comfort and flattery. Subtle hues of khaki and blush mixed with pastel shades of waterfall, misty blue and aqua tears gradually intensify to deep saturated tones and neon brights, making a bold splash for the transition into summer. 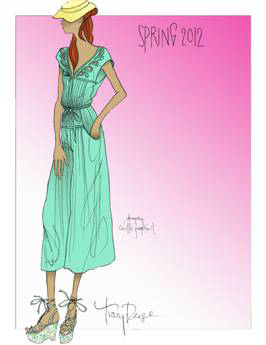 Pre-show New York Fashion Week coverage: fall 2011 inspirations and sketches for TRACY REESE and KAELEN FARNCOMBE. “Fall 2011 unfolds in rich hues, sculptural shapes and interesting textural combinations. Each look has some point of brilliance – a shot of metallic, antique copper and silver, or a vibrant pop of raspberry, aqua or amber – breathing new life into muted neutral tones of toffee, black, brown and gray. First Lady Michelle Obama beat the summer heat in a Tracy Reese sundress when returning to the White House Sunday July 18th, 2010, after vacationing with the first family in Bar Harbour, Maine. 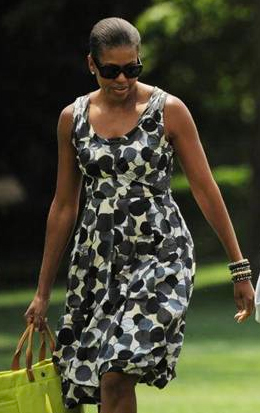 The First Lady looked casual yet chic in the Tracy Reese Black Shadow Dots Draped Frock from the Spring 2010 collection. Tori Spelling looked fresh and polished in a frock! by Tracy Reese dress while promoting her new tell-all, “Uncharted Terri-TORI,” on the “Today” show yesterday morning, June 17th, 2010. The frock by Tracy Reese ZWL3V7N- Alix in Wild Violet is from the current spring 2010 collection and retails for $225. First Lady Michelle Obama in a Tracy Reese dress, so nice she wore it twice! 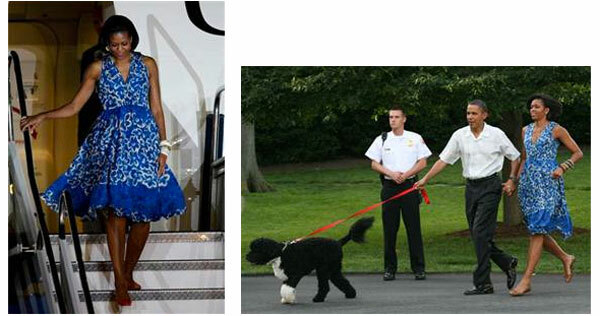 It’s nice to know that even First Lady Michelle Obama repeats an outfit every now and then. First seen stepping off the plane at the Benito Juarez International Airport in Mexico on April 15th, 2010, the First Lady donned the Tracy Reese Shirred Frock in Indigo Placement Floral again yesterday, June 9th, 2010, while attending a picnic on the White House lawn. Actress Taraji Henson looked radiant in a Tracy Reese dress at last night’s, June 3rd, 2010, VH1 Hip Hop Honors, where she walked the red carpet and presented. 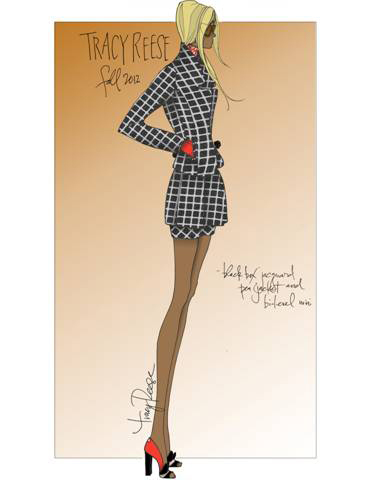 The Tracy Reese dress is fresh off the runway from the fall 2010 collection. Taraji was looking sleek and stylish and made the dress look like million dollars. She hit the red carpet with music sensation Keri Hilson and partied all night long at rap sensation Lil Jon’s “Crunk Rock” album release party. 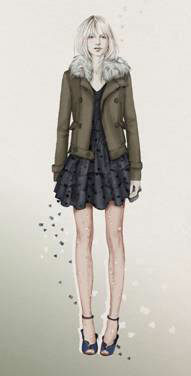 The fall 2010 collection was inspired by a mixture of 70’s Parisian attitude and an urban New York City girl. With a renewed love for classic sportswear, silhouettes have been re-worked with a twist to give subtle edge on signature feminine designs. The palette includes dusty hues and new neutrals contrasted with military olives and hints of old gold. Fabrics are washed to provide a worn, overly-loved appeal and are combined with cashmere wool suits, leopard faux furs and down quilted coats, together giving this collection an affordable luxe quality. During my time in NYC for Fashion Week Spring 2010 last week I stopped by the fabulous CVS & Robert Verdi lounge. The lounge was full of the latest hot new products at CVS. 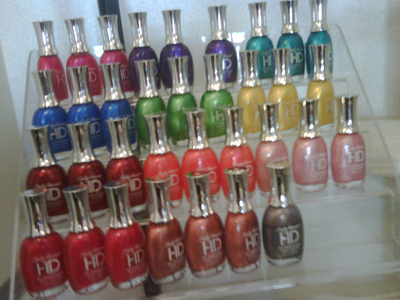 One of them was Sally Hansen latest HD nail color collection which I was absolutely in love with. The manicurist at the lounge applied Sally Hansen HD Nail Polish in Opulent Cloud: a gorgeous silver, with golden and some purple undertones. This shade is very chic and modern and the icing on the cake: it didn’t chip for 4 days!! I call it: “The Nail Polish That Doesn’t Chip”. It’s currently available at CVS, so go check it out!! Also, NEW Sally Hansen Complete Salon Manicure: Watch a sneak peek video backstage at Tracy Reese fashion show during New York Fashion Week Spring 2010 and learn more about Sally Hansen Complete Salon Manicure, a collaboration with fashion designer Tracy Reese ans Sally Hansen. Also in video: Gabrielle Union. A fashionable collaboration between nail color expert Sally Hansen and designer Tracy Reese at her Spring 2010 Runway Show. For the eighth season in a row, Sally Hansen has joined forces with fashion icon Tracy Reese to create the ultimate accessory for the feminine yet modern spring wardrobe, inspired by Reese’s visionary spring collection. The runway look was created with Sally Hansen Complete Manicure in Midnight In New York which provides a deep ebony base, while Hidden Treasure brushes on an unexpected finish of molten metallic, for an exclusive, never-been-seen before manicure. The Tracy Reese For Sally Hansen 2010 Spring Runway Nail Collection will be available nationwide in April 2010.